As if being married to him wasn't hard enough! Nodaway Falls turns out to be a town with more than a little magic in the air. Eliot swore off using her own powers sixteen years ago, thanks to one catastrophic day when she lost the only people who ever mattered to her, and ran away from her spellbinding father and his reckless enchantments. Now, when a chance encounter with quiet, handsome Desmond Lamb results in a magical explosion that rocks Eliot to the core, she can't help but wonder: Has her heart fallen under some sort of spell? Or is this what true love really feels like? The real question, of course, is whether her husband will stop haunting her . . . and let Desmond give her a chance at happily ever after? Lucy March is a hopeless romantic, but that’s alright – I’m one as well. The third book in her Nodaway Falls series gave me exactly what I’d hoped to get – a small community filled with lovable characters, a delicious romance, a nuanced, interesting villain and a very compelling plot. By now, the residents of Nodaway Falls are all very familiar and dear to my heart. I’ve been with them through hell and back, faced danger and walked bravely into the unknown, fell in love and found joy. Going back to them feels a lot like coming home, comforting and familiar in a way that very few things are. We meet Eliot Parker at a very low point in her life. Her husband just died in a car crash while spending a weekend away with his mistress. In addition to being a heartless cheater, he left her with nothing but an old house in the middle of nowhere and his lover’s dog. Eliot has no choice but to move to Nodaway Falls, away from everything she knows and loves. Heartache aside, something very sinister is brewing in Eliot’s new town. Her father, a mad magical scientist of sorts is on her trail after many years of hiding under a different name. Suddenly everything seems to be a product of his manipulations, including Eliot’s new life. Luckily, Liv and the old gang are all there to help, albeit cautiously and with many problems of their own. She might have lost everything, but Eliot also gained some new friends in Nodaway Falls, magical friends who understand her better than anyone else ever has. I felt that Eliot’s conflict over her father was very well done. I love villains I can both sympathize with and hate at the same time, and he was certainly one of those. Even the hero, Eliot’s love interest Desmond Lamb, was so very well done. As the villain of the previous book, Desmond has so much to atone for, and forgiveness was very far from everyone’s minds. 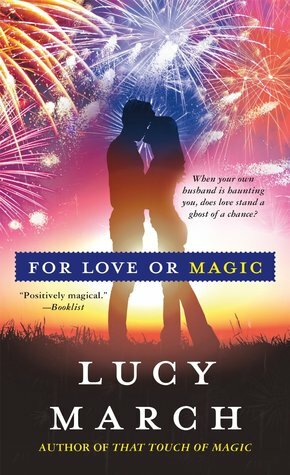 You can always count on Lucy March for delicious, intriguing paranormal romances. I love small communities, towns filled with eccentric fictional people and Nodaway Falls is practically bursting with them. I have no idea what’s coming next for our group of friends, but I’ll definitely be there to find out. This is new to me. It's great when an instalment brings about a craving for the next one! I haven't heard of these books! They sound really well done though. Thanks for sharing. It's nice to have a good PNR book and I'm curious about the sinister event too. thanks for the discovery! I haven't heard of this series before. I like to pick up a PNR when I need a genre break. I will keep this one in mind. Thanks for putting it on my radar! A small town paranormal romance? I don't think I've ever read a book like that but I'm intrigued, especially if the villains are well-written. I'm always up for a good twisted villain. I hadn't heard of this author before, but I'll be checking out her books in the future. I love small town books, they are just fun and cozy, plus if this one has paranormal to it, even better. This sounds like it has everything I love in small town romances as well! Great review Maja! This one sounds like a very good mix of paranormal elements and more everyday life, and having the villain of the previous book as the hero in this one sounds even more interesting!